This 2017 video is called Prehistoric Subject Files Ep. 16: – Lambeosaurus. Paleontologists from Hokkaido University in Japan, in cooperation with paleontologists from the Perot Museum of Nature and Science in Dallas, Texas, have discovered the first-confirmed occurrence of a lambeosaurine (crested ‘duck-billed’ dinosaur) from the Arctic — part of the skull of a lambeosaurine dinosaur from the Liscomb Bonebed (71-68 Ma) found on Alaska’s North Slope. The bonebed was previously known to be rich in hadrosaurine hadrosaurids (non-crested ‘duck-billed’ dinosaurs). The paleontologists’ findings were published today in Scientific Reports, an open-access, multi-disciplinary journal from Nature Research dedicated to constructive, inclusive and rigorous peer review. The paper — entitled “The first definite lambeosaurine bone from the Liscomb Bonebed of the Upper Cretaceous Prince Creek Formation, Alaska, United States” — is co-authored by Yoshitsugu Kobayashi, Ph.D., and Ryuji Takasaki, of Hokkaido University, in cooperation with Anthony R. Fiorillo, Ph.D., of the Perot Museum of Nature and Science. Other authors are Ronald Tykoski, Ph.D. of the Perot Museum and Paul McCarthy, Ph.D., of the University of Alaska. 1. The first Arctic lambeosaurine: The new discovery indicates Arctic inhabitance and adaptation of lambeosaurines for the first time. In addition, the fossil’s morphological similarities to the same bone in the skull of southern Canadian lambeosaurines suggest faunal interactions between the Arctic and the mid-latitudes. 2. 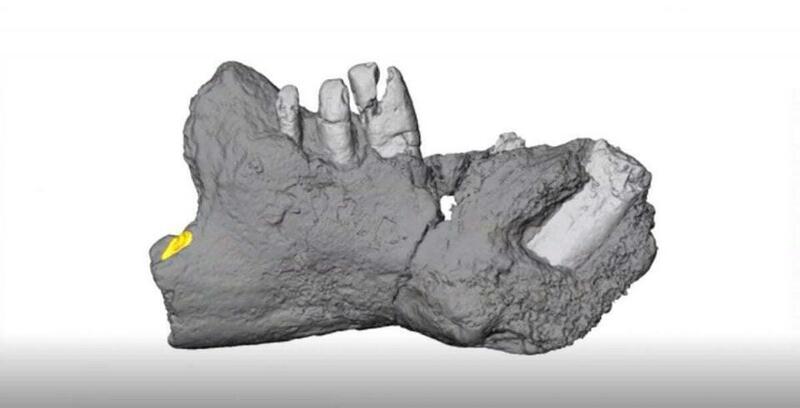 Implication on habitat preferences: While the Liscomb Bonebed is known for numerous hadrosaurine fossils, the newly discovered bone represents the only definite lambeosaurine fossil from the site. The same trend is also known in mid-latitude localities of North America and eastern Asia, which were also deposited in near-shore environments. On the other hand, more lambeosaurine fossils are found in deposits laid down in inland environments. Therefore, we hypothesize that lambeosaurines favored inland environments, while hadrosaurines preferred coastal environments, a trend likely to have been independent of latitude. Different habitat preferences might have been a strategy to avoid excessive competition between the two groups of ‘duck-billed’ dinosaurs. Although the new discovery reveals Arctic inhabitance by lambeosaurines, more specific taxonomic status and potential functional adaptations to the severe Arctic environment remain unknown due to incompleteness of the specimen. Additional excavation and further research will help answer these questions. This 20 September 2017 video from the USA is called Dinosaur fossil experts calling on amateurs to help dig in North Dakota. Summary: Paleontologists have found a fossil site in North Dakota that contains animals and plants killed and buried within an hour of the meteor impact that killed the dinosaurs 66 million years ago. This is the richest K-T boundary site ever found, incorporating insects, fish, mammals, dinosaurs and plants living at the end of the Cretaceous, mixed with tektites and rock created and scattered by the impact. The find shows that dinosaurs survived until the impact. Chickens and ducks are up and about within hours of hatching, they are “precocial”. Pigeons and eagles are “altricial”, they stay in the nest and are looked after by their parents. How do you tell if a hatchling came “out of the egg running” or was “naked and helpless in the nest”? Feathers. When precocial birds hatch they have developed down feathers and partly developed large feathers and can keep warm and get around without mum’s help. “Previous studies searched for but failed to find any hints of feathers on the Los Hoyas hatchling. This meant that its original lifestyle was a mystery”, says Dr Pittman. 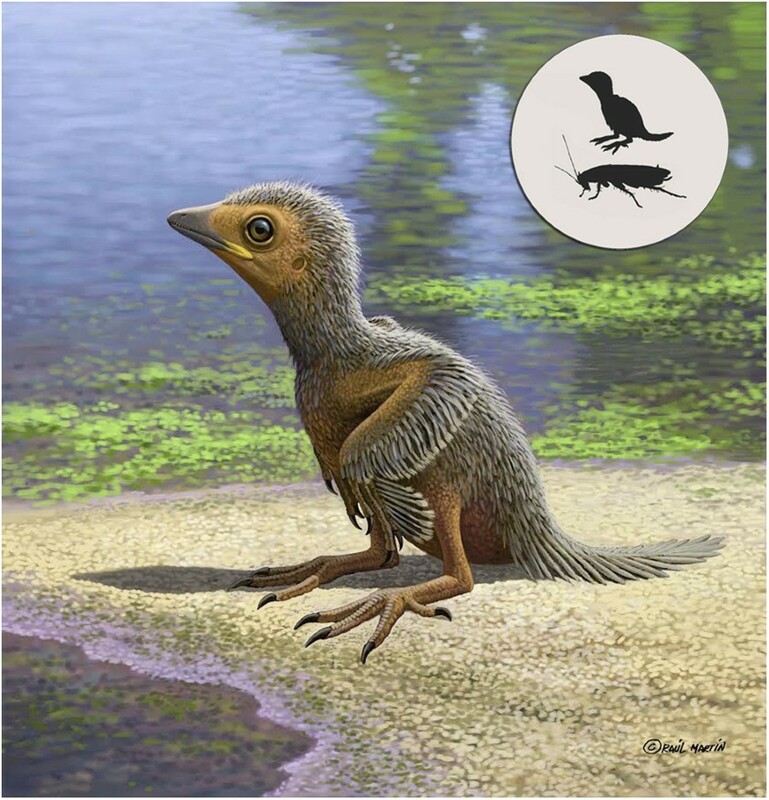 This reconstruction of the hatchling is from 2018, when its feathers had not been discovered yet. Michael Pittman and Thomas Kaye brought new technology to the study of Los Hoyas fossils in the form of a high power laser. This made very small chemical differences in the fossils become visible by fluorescing them different colours, revealing previously unseen anatomical details. They recently had tremendous success with the first discovered fossil feather which they disassociated from the famous early bird Archaeopteryx by recovering the chemical signature of its fossil quill, a key part of the feather’s identification that had been previously unverified for ~150 years. The new results on the hatchling bird finally answered the question about its lifestyle as it did indeed have feathers at birth and was thus precocial and out of the egg running. The feathers were made of carbon which has low fluorescence using Laser-Stimulated Fluorescence (LSF), but the background matrix did glow making the feathers stand out in dramatic dark silhouette. “Previous attempts using UV lights and synchrotron beams failed to detect the feathers, underscoring that the laser technology stands alone as a new tool in palaeontology” added Tom Kaye, the study‘s lead author. This discovery via new technology demonstrates that some early birds adopted a precocial breeding strategy just like modern birds. Thus, in the time of the dinosaurs, some enantiornithine bird babies had the means to avoid the dangers of Mesozoic life perhaps by following their parents or moving around themselves. “One of the feathers discovered was of a substantial size and preserves features seen in other hatchlings. It indicates that our hatchling had reasonably well-developed flight feathers at the time of birth”, says Jesús Marugán-Lobón, a co-author from the Universidad Autónoma of Madrid, Spain. This and other “illuminating” discoveries are adding to our knowledge of ancient life with details surviving in the fossil record that were never thought possible even a couple decades ago.